Reliable Sources videos: Carl Bernstein, equal time, Goosebumps. Janice Dean: A letter to myself, ten years ago. Prized pictures. Carlson on the couch: Tucker showing greater ease, confidence. Today’s frivolous lawsuit. Richard Grenell crosses party lines. TCG: A strange way for MSNBC to brand itself as ‘nonpartisan’. (MS)NBC mum as controversy swirls around Mohyeldin’s reporting. Coop returned speaker’s fee to UNLV Fndn. Sunday talkers: preview. Thursday’s numbers: Bill O’Reilly-Megyn Kelly-The Five 1-2-3. Grenell: The astonishing bias of (MS)NBC’s Ayman Mohyeldin. Griswold: Botched hit-job by Dylan Byers should embarrass CNN. Report: CNBC agrees to Trump demands. Isenstadt: CNBC caves. Concha: Trump’s credibility on the line in showdown with CNBC. Wemple: Coop ‘knew’ Sanders’s reply would ‘shut down’ email talk. After big debut, Leno’s Garage stalls out. Worth a thousand words. Josh Levs at Stony Brooke U. Joy-Ann Reid in Winston-Salem, NC. Golgowski: Lynne Russell lawsuit claims motel ignored known dangers. Wemple: Donald Trump officially assumes full ownership of cable news. Wednesday numbers: Bill O’Reilly-Megyn Kelly-The Five 1-2-3. GOP issues with CNBC debate grow: Trump threatens pull out. Ross: CNN treated Lemon and Lopez like ‘window-dressing‘. CNN touted free streaming of debate, but it didn’t quite pan out. Former terrorism ‘expert’ Wayne Simmons charged with fraud. Somerby: It’s ‘one of the strangest programs in cable news history’. Maloney: Sanders supporters fuming over CNN comment deletions. Riedl: Judge rules ‘filming’ can continue on MSNBC signature series. Updated 5:23 pm Use our valuable bandwidth to post your cable news comments in today’s open thread. MSNBC ‘hard news’: What kind of sandwich is Bernie Sanders? Somerby: Maddow’s reporting ‘grossly misleading…flatly false’. Megyn Kelly: We overestimated Trump’s ‘anger management. Isenstadt: GOP squabbling with CNBC over upcoming debate. CNN gets 15 million; Concha’s victory lap; Hugh Hewitt to return. Zurawik: Don’t blame Cooper; Hillary steamrollered over him. ICN: CNN letting its own employees review its own employees?! Concha: A solid ‘A’ for Coop. Were Lemon and Lopez ‘tokenized‘? Coop’s notes gave him the edge. The truth about Coop and Clinton. Abbruzzese: Coop ruled with ‘an iron fist‘. How to silence Don Lemon. Chariton: CNN ‘insiders’ worried debate would ‘bomb’ without Trump. Updated 6:05 pm Use our valuable bandwidth to post your cable news comments in today’s open thread. J$P Video! 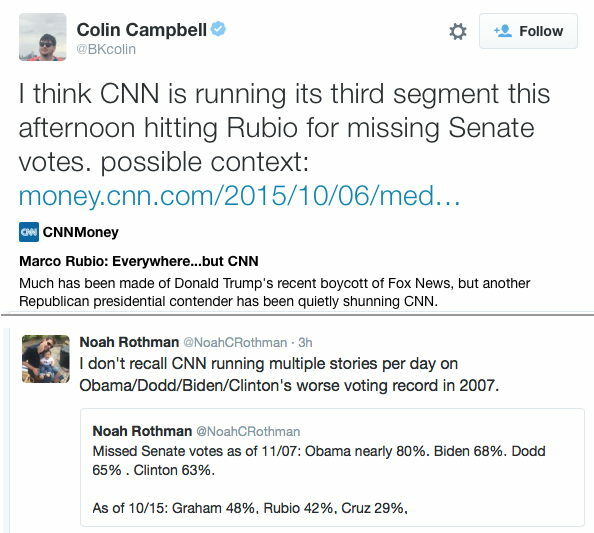 Does CNN have a double standard for debates? Monday’s numbers: Bill O’Reilly-Bret Baier-The Five 1-2-3. Q&A: Ed Henry on Fox vs CNN, etc; Sean Hannity on McCarthy etc. Concha: Unfriendly fire complaints ding Fox News and MSNBC. Donny Deutsch resurfaces, brings Joe and Mika into his world. Chuck Todd hour hit by ‘big fall off‘ in ratings. Weekend numbers. York: CNN’s double standard for debates. CNN fact-check failure? Lyons: CNN should give more airtime to Dana Bash in the debate. Ads during CNN’s Dem debate going for half the price of GOP debate. Parker: CNN hopes smaller field, greater focus will lure debate viewers. McCall: Why the CNN Democratic debate will be as useless as the GOP’s. Friday’s numbers: Bill O’Reilly-Chris Wallace-The Five 1-2-3. After avoiding Fox News Sunday Trump agrees to face Chris Wallace. Scarry: CNN debate will not pit Dem candidates against each other. Concha: Why CNN’s Democratic debate will top 10 million viewers. CNN enlists Sheryl Crow to juice the expected lower debate ratings. Yang: So why isn’t Jake Tapper hosting CNN’s Democratic debate? Tillison: Is CNN trying to protect Democrats from themselves? More. Baker: Impartial MSNBC ‘reporter’ is impressed by Farrakhan’s march. Reliable Sources videos: Jason Rezaian trial, Coop, Trump, Rupert’s tweets. Wemple: Frank Luntz scorches Media Matters…’it’s an embarrassment’. MSNBC Q&A: Thomas Roberts; José Díaz-Balart; Janet Mock (via TVN). Cohen: Why does the right get a seat at the debate table, but not the left? Cable Hall of Fame honors little-watched morning program. Sorry, Ronan. Trish Regan tops CNBC, Chuck Todd edges Wolf. Sunday talkers: preview. Thursday’s numbers: Bill O’Reilly-Sandra Smith-Bret Baier 1-2-3. Concha: Why Noah Trevor is laughable lecturing Rupert Murdoch. Somerby: Rachel’s comedy relief…she always [hearted] Boehner. talks politics with Trevor Noah. Salzman: CNBC mum in GOP debate controversy. Q&A: Kate Snow. looks at the Ben Carson controversies. on smearing Ben Carson, and more. Lapointe: Who gains from Kevin McCarthy’s fall? Maybe Chuck Todd. CNN reveals the ten Heroes contenders. Russkies rip CNN reporting. Wemple: Free Rachel Maddow (and the candidates). Twitter trumps tv? More synergy at NBC/MSNBC. Leno means ratings at CNBC…or does he? Wednesday numbers: Bill O’Reilly-Megyn Kelly-Bret Baier 1-2-3. Megyn Kelly to give Albany Law School Commencement address. Tamron Hall to replace Bill Cosby. CNN AppleWatch app upgraded. on the MSNBC ‘pimping’ scandal. Former NABJ Prez claims FNC is ‘very difficult‘ for black employees. TCG: Rehiring Olby would make MSNBC ‘the place for prevaricators‘. Q&A: Lisa Ling. The Circuit in Mexico; Open Court previews Davis Cup. Dem debate trimmed. CNN pounces when Murdoch tweets. Update. Coop: no ‘gotcha’ questions at debate. CNN debate hype in overdrive. Fox News at 19: A look back, with an O’Reilly clip from day one. Savan: Source says NBC and MSNBC share ‘one set of values’. Gold: MSBNC’s Morning Joe ‘pressured’ to simulcast Hillary event. MSNBC to air Democratic ‘forum’ moderated by…Rachel Maddow. Roush: Stuart Varney on Fox Biz hits ratings high, tops rival CNBC. Key demo viewers (25-54) tuning out the ‘new’ MSNBC. Blood Lions. Bourdain’s food hall. Look for the union label at Al-Jazeera America. Byers: Given record low ratings, why is All In with Hayes still on MSNBC? CNN’s Tom Foreman got lost running in the desert (a preview of his book). as payback for a ‘silent boycott‘ (via CNNC)? Monday’s numbers: Bill O’Reilly-Megyn Kelly-Bret Baier 1-2-3. Funny thing about that Fox News/Trump meeting…it didn’t happen. Flood: Andrea Mitchell complains about use of her voice in Hillary ad. Concha: Lack and Olbermann may meet re potential return to MSNBC. Twitter and FNC team for “moments” feature. Kilmeade makes book. Greenwald: CNN is obscuring who is responsible for hospital attack. ICN: Another hour of Morning Joe opens MSNBC up to more problems. E-Tourism rips Kenya’s ad buy on CNN. Pundits’ first jobs (v/Fishbowl). Wellen plans to expand CNNgo to prep ‘webolution’. Weekend numbers.